In the treatment of patients with DME, this location may offer an alternative for sustained-release corticosteroid implants. Recent insights into retinal physiology suggest that the retinal dysfunction associated with diabetic macular edema (DME) is characterized by multifactorial pathophysiology.1 The upregulation of inflammatory factors, including VEGF2,3 and intercellular adhesion molecule-14 and the downregulation of antiinflammatory factors such as pigment epithelium-derived factor5 are thought to lead to the breakdown of the blood-retina barrier characteristic of DME. • Intravitreal steroid injections have demonstrated good short-term outcomes for managing DME, but edema recurrence, increased IOP, and lens changes can occur. • Intravitreal steroid implants provide durable control of DME, although complications still remain. • The suprachoroidal space may offer an alternative route of delivery for steroid implants to control DME. Therefore, antiinflammatory treatment of DME with corticosteroids has become a standard approach to managing this chronic condition. Intravitreal bolus injection of steroids leads to good short-term outcomes. However, increased intraocular pressure (IOP) occurs in approximately 30% of eyes, and development of cataract is common. This is especially true when multiple serial injections are used to control chronic DME. We also know that the effect of combining an intravitreal steroid with vitrectomy is temporary due to the high clearance rate in vitrectomized eyes compared with nonvitrectomized eyes. One solution to this rapid clearance is the use of extended-release corticosteroid implants. Several extended-release implants have been developed and commercialized. These implants are labeled for intravitreal injection, but it is also possible to deliver them into the suprachoroidal space. This route of delivery may have advantages in vitrectomized eyes, prolonging the duration of drug delivery. I have previously written in these pages about the use of a catheter to deliver corticosteroids to the suprachoroidal space.6 In this article, I describe the novel use of a durable steroid implant in the suprachoroidal space in a series of patients with DME. The CHAMPLAIN study found that the dexamethasone intravitreal implant 0.7 mg (Ozurdex, Allergan) statistically significantly improved vision and reduced vascular leakage caused by DME in difficult-to-treat vitrectomized eyes.7 As these authors reported, however, these extended-release steroids are associated with increased IOP and cataract formation in a significant percentage of patients. The vehicle of the fluocinolone acetonide intravitreal implant 0.19 mg (Iluvien, Alimera Sciences) is composed of an inert, nonbiodegradable, polyimide material that is commonly used in intraocular lenses. The implant is a tiny cylindrical tube, 3.5 mm long, with a diameter of 0.37 mm. The FAME study, which consisted of two 3-year, phase 3 pivotal clinical trials to assess the safety and efficacy of the fluocinolone acetonide intravitreal implant 0.19 mg for DME, showed that 28.7% of patients receiving the 0.2-µg daily dose disbursed by the implant experienced a ≥15-letter gain in visual acuity at 24 months, and this gain was maintained over 36 months.8 Again, this implant was associated with certain complications: Cataract developed in 80% of phakic patients enrolled, ocular hypertension was an issue in 38% of patients, and glaucoma surgery was required in 4.8% of total patients enrolled. Olsen et al9 demonstrated in a porcine model that the suprachoroidal space could serve as a reservoir for sustained-release formulations, establishing a steep concentration gradient for drug diffusion in the retina and choroid. These authors also showed a high local drug concentration in the choroid and retina in the macular region that lasted for at least 4 months. As noted above, in a series of 38 patients with DME, 8 mg of triamcinolone delivered to the suprachoroidal space via a catheter resulted in sustained improvement in visual acuity and reduction of central retinal thickness on optical coherence tomography (OCT) for 5 months.6 One patient had an increase in IOP that required medical treatment during 6 months of follow-up. We have also used the dexamethasone intravitreal implant 0.7 mg in the suprachoroidal space to treat Vogt-Koyanagi-Harada disease and to treat patients with resistant macular edema secondary to central retinal vein occlusion. We did not see an increase in IOP in any of these patients during the 6-month follow-up period. Figure 1. The injection cannula on a viscoelastic syringe (A). The catheter with plunger mechanism used to deliver the fluocinolone acetonide intravitreal implant 0.19 mg (B). 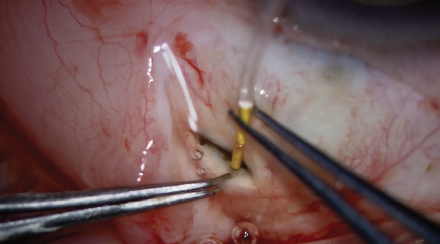 Guided by our previous work with steroids in the suprachoroidal space, I initiated a trial in which the fluocinolone acetonide intravitreal implant 0.19 mg is placed in the suprachoridal space. The goal of this ongoing trial is to evaluate whether the implant could control macular edema in patients with DME during a period of 3 years while avoiding the complications commonly associated with intravitreal steroid use. We hope to determine whether the low dose of drug disbursed by the implant can achieve macular concentration of drug equal to that achieved with intravitreal implantation. We also hope to learn how close the implant must be positioned to the macula to maximize efficacy and whether there will be increases in IOP or cataract development during the 36 months of the drug delivery. This trial will eventually include 25 patients, and the primary endpoint assessment will be made after the first 12 months. In this article, I present an interim report on the first 16 patients enrolled, with 8 months’ follow-up. The implantation procedure is performed using one port with a trocar-cannula to accommodate a chandelier light. No vitrectomy is needed. The chandelier light is placed in the inferotemporal quadrant, and a conjunctival incision is made at 12 o’clock at the limbus to expose the sclera. Then a 2-mm scleral incision is made 4 mm from the limbus. The last lamella of the sclera is opened using diathermy, taking care not to injure the choroid. Next, a suprachoroidal pocket, at the boundary separating the choroid from the sclera, is created at the entry site using viscodissection. 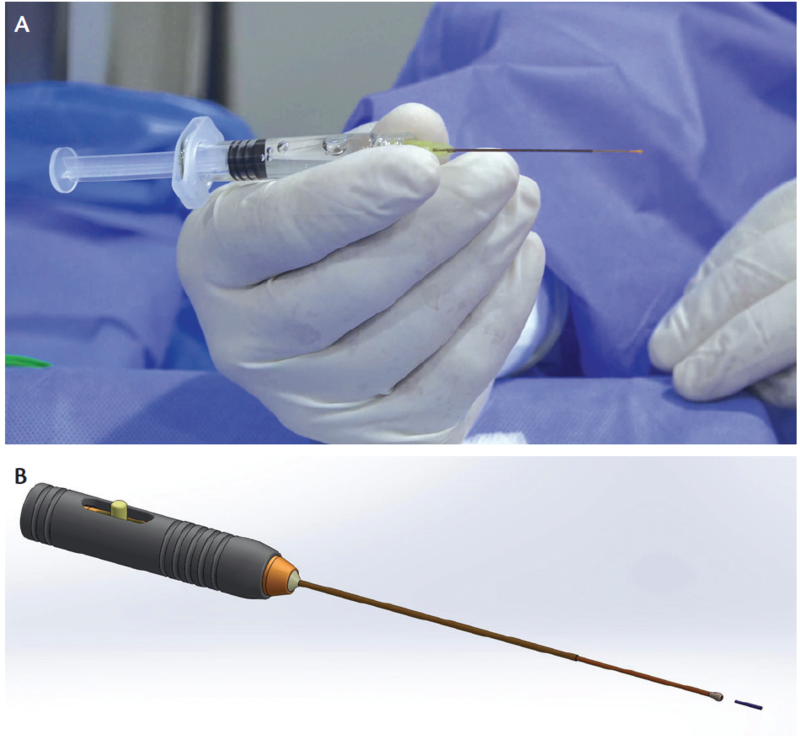 The fluocinolone acetonide intravitreal implant 0.19 mg is advanced outside its container and reloaded into a flexible-tipped disposable cannula (Olive Tip SC Cannula, MedOne Surgical) shown in Figure 1A. We have also developed a flexible-tipped catheter with the same olive-shaped tip for delivery to more posterior locations (MedOne Surgical). This tool uses a rod displacement mechanism to gradually push the implant into the desired space (Figure 1B). The cannula we developed for drug delivery can also be used to inject a viscoelastic substance to displace the fluocinolone acetonide intravitreal implant 0.19 mg pellet to the location desired in the suprachoroidal space. The cannula or catheter is gradually advanced into the suprachoroidal space while the surgeon looks through the microscope, using the chandelier light to guide it to the macular arcades, where the pellet is injected into the suprachoroidal space (Videos 1 and 2). In our trial to date, we have delivered implants to several locations around the arcade region and below the disc to determine whether location and/or proximity influences efficacy. After placement, the catheter and chandelier light are withdrawn and sutures are used to close the sclerotomy and conjunctiva. The implantation site is evaluated clinically and by OCT postoperatively (Figures 2 and 3). Figure 2. Color (A) and red-free (B) fundus images of a fluocinolone acetonide intravitreal implant 0.19 mg positioned below the disc in the suprachoroidal space. The arrows point to the device’s location. Figure 3. OCT image of the fluocinolone acetonide intravitreal implant 0.19 mg below the disc. Note the rounded section of the implant in the suprachoroidal space with the choroid and retina overlying the implant. There has been a learning curve for the procedure regarding how best to guide the injecting device to the target tissue. We have not observed any hemorrhage in the 16 patients injected to date. In one patient, the pellet was delivered subretinally, and this patient is being followed closely. 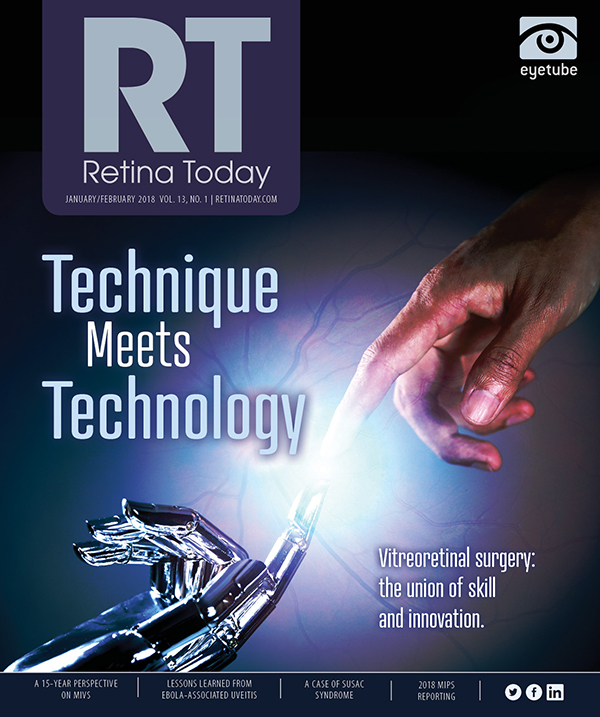 Retinal thickness was stable at 2 months after injection (no improvement), and gradual improvement was seen thereafter. We consider this to indicate a delayed response with suprachoroidal implantation compared with that seen in intravitreal implants. With 8 months’ follow-up now complete in 16 patients, there have been no increases in IOP in any patient and no lens changes in the phakic patients. 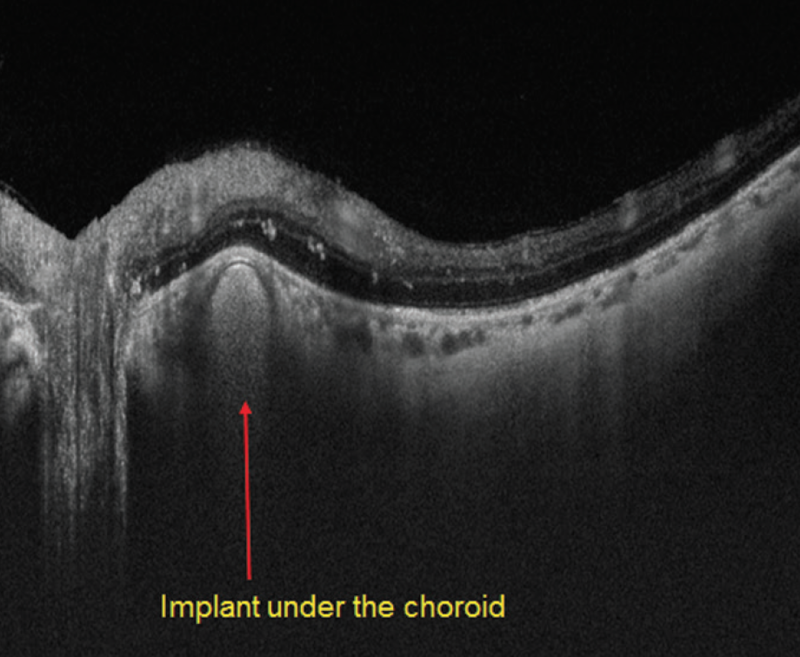 We speculate that the late response seen in this series is related to the lower dose release (0.2 µg daily dose) of the implant compared with our previous experience using bolus injections of steroids into the suprachoroidal space, which resulted in higher drug concentrations in the choroid and retina. Sustained-release corticosteroid delivery is an important addition to our options for the treatment of patients with DME. The suprachoridal approach to delivering the fluocinolone acetonide intravitreal implant 0.19 mg described in this article has the potential to provide similar efficacy with less incidence of increased IOP and lens changes seen with intravitreal implantation. Our initial 8-month follow-up results presented here are promising, but the question of the proper dose for use in the suprachoroidal space must still be addressed. As noted, this trial will eventually include 25 patients, and the primary endpoint assessment will take place at 12 months’ follow-up. Results published after that assessment will hopefully help answer the question of whether suprachoroidal steroid implantation will convey an advantage in the treatment of patients with DME. 1. Antonetti DA, Klein R, Gardner TW. Diabetic retinopathy. N Engl J Med. 2012;366(13):1227-1239. 2. Qaum T, Xu Q, Joussen AM, et al. VEGF-initiated blood-retinal barrier breakdown in early diabetes. Invest Ophthalmol Vis Sci. 2001;42(10):2408-2413. 3. Funatsu H, Yamashita H, Nakamura S, et al. Vitreous levels of pigment epithelium-derived factor and vascular endothelial growth factor are related to diabetic macular edema. Ophthalmology. 2006;113(2):294-301. 4. Lu M, Perez VL, Ma N, et al. VEGF increases retinal vascular ICAM-1 expression in vivo. Invest Ophthalmol Vis Sci. 1999;40(8):1808-1812. 5. Zhang SX, Wang JJ, Gao G, Shao C, Mott R, Ma JX. Pigment epithelium-derived factor (PEDF) is an endogenous anti-inflammatory factor. FASEB J. 2006;20(2):323-325. 6. El Rayes EN. Suprachoroidal steroid delivery. Retina Today. 2013;8(5):49-51. 7. Boyer DS, Faher D, Gupta S, et al; Ozurdex CHAMPLAIN Study Group. Dexamethasone intravitreal implant for treatment of diabetic macular edema in vitrectomized patients. Retina. 2011;31(5):915-923. 8. Campochiaro PA, Brown DM, Pearson A, et al; FAME Study Group. Sustained delivery fluocinolone acetonide vitreous inserts provide benefit for at least 3 years in patients with diabetic macular edema. Ophthalmology. 2012;119(10):2125-2132. 9. Olsen TW, Feng X, Wabner K, et al. Cannulation of the suprachoroidal space: a novel drug delivery methodology to the posterior segment. Am J Ophthalmol. 2006;142(5):777-787. 10. Rizzo S, Ebert FG, Bartolo ED, et al. 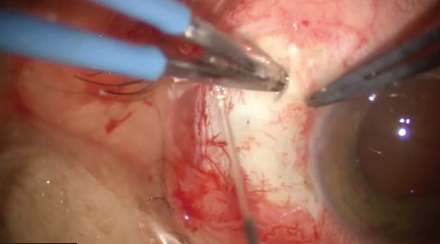 Suprachoroidal drug infusion for the treatment of severe subfoveal hard exudate. Retina. 2012;32:766-784.